One of the reasons why I have chosen blue-chip investing as the medium of choice to advocate is because there is so much downside protection—absent falling demand due to technology change or a lack of liquidity and a super-leveraged balance sheet like you saw at Wachovia, it’s almost impossible to take down a $100 billion company. Anyway, I was checking the numbers on what has happened to General Electric stockholders over the past decade, and they’re officially in the black: if they dutifully reinvested and let their GE shares run on autopilot, they would have grown their position from 322 shares outstanding to 460 shares, and giving them total annual returns in the 1.5-2% range. No, those aren’t returns to aim for at the moment of contemplation, but think about the conditions that existed and surrounded a GE investment over the past decade: the company was trading at 22x profits (modest overvaluation), and was about to experience a devastating dividend cut down to $0.10 per share because if a low Tier 1 Capital Ratio and a disastrous real estate loan portfolio that consisted of largely non-performing assets when the worst of the financial crisis hit. By that time, GE Capital was responsible for half of GE’s total profits, and the finance division’s non-performing assets and low liquidity to weather the storm caused profits to plummet from $22 billion to a little over $11 billion (note: that’s the part that’s never talked about—even in the worst of the crisis, GE was generating almost $1 billion in profits each month for shareholders). By a show of hands, how many people out there can say they slightly overpaid for a stock that exploded during the financial crisis and then had left you at the breakeven point or so, once you adjust for inflation? That steadily growing share count you see in the picture is a buffer of sorts—every time additional shares get added to your account, the share price can fall by a little bit more—each dividend payment builds additional downside protection into your investment. I expect that several years from now, the returns will even get better as General Electric continues to improve (over 75% of its profits now come from an industrial segment growing at 8% annually while the other 25% come from GE Capital that consists of much higher-quality finance divisions that are better capitalized than where GE was before the crisis). In 2020 or so, GE will be paying out a $0.40 quarterly dividend, and the recovery decade of 2010-2020 will perk up the experience for those who purchased their shares before the financial crisis. As long as the company stays alive (e.g. avoiding the fate of General Motors), time can do a lot of healing. The investor community frequently rags on companies like General Electric and BP, usually to advance the argument that you can’t hold the same stock for a long period anymore. What I find interesting is that, for those who stick with the company, the curse of picking the wrong stock at the wrong time is usually five to ten years of dead money time, as opposed to a 100% loss of investment. GE investors have collected a third of their investment back in the form of dividends over the past decade, and that includes the brutal dividend cut during the financial crisis. 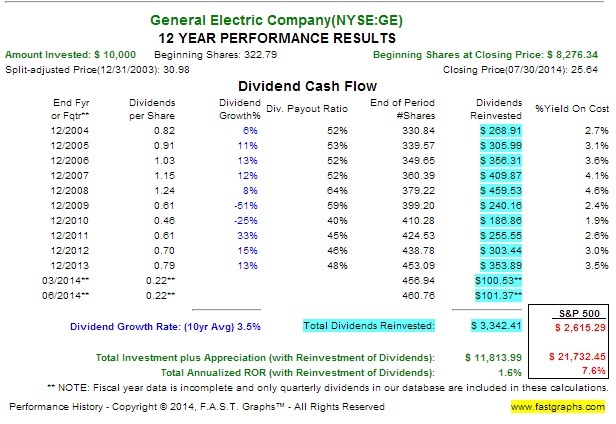 But by reinvesting dividends, you were able to increase your share count in GE by 42% over the past ten years. That plays an important role in the recovery process that is easy to ignore when all you hear is that the dividend declined to $0.10 per share in 2009. ← What If You Treated AT&T Dividends Like A Big Fat Mother Goose?